Stephanie Sena, 39, clears up a stack of medical bills from a foot amputation she had last fall. Sena is an adjunct professor at Villanova University with $20,000 in medical debt after learning her health plan didn't offer adequate coverage. Stephanie Sena was about to have half her foot amputated, an urgent procedure to keep a blood infection from spreading to the rest of her body. But the surgeon required payment up front and the insurance plan that the 39-year-old Villanova University adjunct professor bought months earlier was refusing to pay. She had less than 24 hours to come up with $1,920. Sena’s insurance plan, it turned out, was not real health insurance. It was an accident and sickness hospital indemnity plan that paid a set dollar amount for certain services. This surgery was not on the list. She has since gotten a $1,725 refund for seven months of premiums, after The Inquirer contacted the company, but that will barely put a dent in the $19,000 medical debt she’s accumulated since enrolling in a plan that covers virtually nothing. The Affordable Care Act restricted skimpy health plans that can deny coverage for basic services and preexisting conditions, but they are making a comeback under the Trump administration, which has made them more available and recently renewed its push to abolish the ACA entirely. Emboldened by the national rhetoric, these plans are being marketed to look more and more like full health insurance and aggressively pushed to people shopping for plans that meet the health law’s standards. People who realize their mistake only once they use the plan can fall fast and deep into medical debt. State-level consumer protections are generally weak and rely on a complaints-based approach to pursuing bad actors — quicksand cases of he-said-she-said, fine print, and technicalities. Sena, who lives in Philadelphia with her two children, turned to the internet for health insurance in August, after separating from her husband and losing coverage under his employer-sponsored health plan. She’s not eligible for Villanova’s health insurance because her position is part time, but going without insurance wasn’t an option. Sena has neuropathy in her foot, a legacy of nerve damage from a bad fall years ago. The condition is common among diabetics who, like Sena, are prone to infections from wounds that don’t heal. She has already lost three toes. Stephanie Sena at her home in Queen Village. So she Googled health insurance. She found Health Insurance Innovations. Through the website, independent brokers sell short-term medical plans that do not meet the minimum coverage standards set during the Obama administration, such as pregnancy, preventive care, preexisting conditions, and other basics. But Sena’s plan was even worse, an indemnity plan that pays only a set rate for a limited list of services. “They’re not what we would call real health insurance,” Linda Blumberg, an economist and fellow at the Urban Institute, said of indemnity plans. Individual health plans subject to the ACA must spend at least 80 percent of the money they collect in premiums on members’ care. Limited-benefit plans spend as little as half their premiums revenue on actual care, said Gary Claxton, a vice president with the Kaiser Family Foundation. Republicans argue that such options should be available to people who don’t want to pay for more coverage than they believe they need. But skimpy health plans are increasingly being pushed to people shopping for comprehensive coverage with keywords such as ACA enroll and Obamacare plans, according to a study by the Center for Health Insurance Reforms. When Sena signed up for her plan, a broker told her it was “not ACA compliant.” The letter she got from the insurance company, Federal Insurance Co., notes that the plan does not cover emergency services or preexisting conditions. But the insurance broker didn’t fully explain the plan’s limitations, she said. She was told only that the plan wouldn’t cover pregnancy, drug treatment, or gender reassignment — none of which she needed. Health Insurance Innovations did not respond to multiple requests for comment. Chubb, the parent company of Federal Insurance Co., said in a statement that it requires brokers to provide customers with disclosures describing the coverage and stating that the plans don’t meet ACA coverage requirements, but it declined to say how it ensures those standards are being met. After The Inquirer contacted the companies, Sena was refunded the $1,724 she paid for seven months of premiums for the indemnity plan, as well as an add-on pharmacy plan and life insurance policy she was sold. $15,508 for an ER visit at Pennsylvania Hospital for sepsis, which is when an infection spreads to the bloodstream. $3,533 for the ambulance that transferred her from Pennsylvania Hospital to Hospital of the University of Pennsylvania for more specialized care. $3,512 for the amputation days later by her foot surgeon at Rothman Orthopedic Institute. When Rothman required payment before the surgery, Sena’s ex-husband agreed to pay for the amputation. 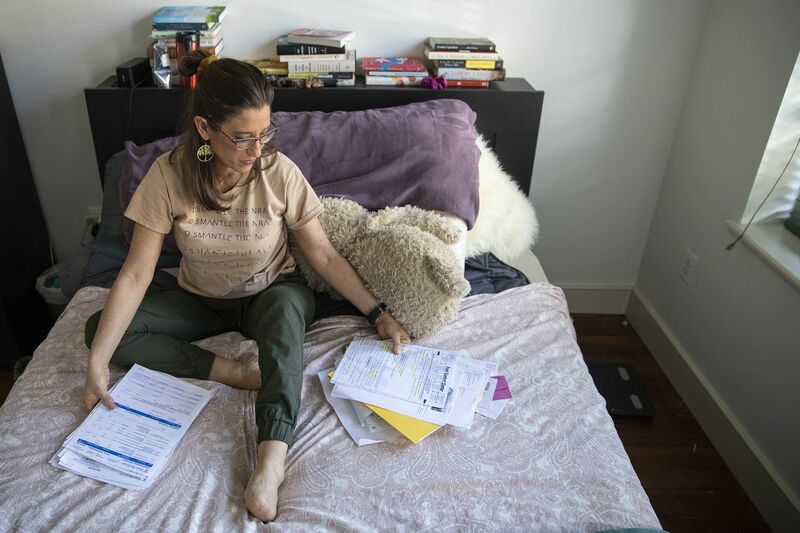 Stephanie Sena, 39, sits on her bed surrounded by a folder full of medical bills from a foot amputation she had last fall. Doctors commonly require partial advance payment as a way to reduce the amount of unpaid bills and administrative resources spent tracking down delinquent payments, said Jolene Calla, a vice president of health-care finance with the Hospital & Healthsystem Association of Pennsylvania. Patrick Norton, the vice president of public affairs at Penn Medicine, said in a statement that the hospital system has seen an increase in the number of patients surprised by high out-of-pocket costs, which he attributed to limited-benefit and high-deductible health plans. Sena isn’t sure where the rest of the money will come from. “The hardest part of all of this — all of it — is dealing with the bills,” she said. It’s a growing problem that state regulators are struggling to control. Since 2016, the state has revoked licenses from 12 brokers found to be misrepresenting the plans they were selling. And in December, Pennsylvania was part of a 43-state, $3.4 million settlement with Health Insurance Innovations. Without admitting wrongdoing, the company must improve sales-call monitoring and periodically submit monitoring reports, establish a disclosures plan to make customers fully aware of policy details, and train all sales representatives on insurance law. As of Jan. 1, Sena is enrolled in a health plan from Independence Blue Cross that meets all the ACA’s requirements for coverage. Yet she’s still having trouble getting what she needs. After her amputation, Sena’s doctor prescribed therapeutic sneakers that accommodate an insert made to fit her new foot shape and that offer extra protection against injuries. The shoes are most commonly prescribed to diabetics, who are prone to nerve damage in their feet, wounds, and amputations. Blue Cross only pays for the shoes for diabetics, so Sena paid for the $214 sneakers herself. After being contacted by The Inquirer, Blue Cross connected Sena with a health educator, who helps members access benefits based on their medical condition. Sena may be able to avoid denials in the future and is now getting medications she’d been skipping because of the price. But even with better insurance, Sena knows the bills will keep coming and she worries whether she’ll have the stamina to keep up. “If the sickness doesn’t break me, it’s the bills that will,” she said. Limited-benefit health plans are becoming more available, and they can be difficult to tell apart from traditional health insurance. Coverage for essential health benefits, such as pregnancy, mental health, primary care, mammograms, colonoscopies, and other preventive screening tests. Cannot deny coverage or charge higher rates because of preexisting conditions. Limit the amount members can be required to spend out of pocket. Must spend 80 percent of money collected in monthly premiums on patient care. Limited-benefit plans are not required to follow these rules. They have much lower premiums in exchange for fewer benefits — they often do not cover pregnancy or preexisting conditions, have smaller doctor networks, and do not have to cap out-of-pocket spending. Learn more about your options here. The best way to be sure the plan you are buying is a comprehensive health plan is to buy it at healthcare.gov, an online insurance exchange that exclusively sells plans that meet the ACA’s coverage rules. About 80 percent of people who buy plans through healthcare.gov are eligible for income-based tax subsidies to offset the cost of insurance. 3. Go to a local broker. People who do not qualify for a premium tax credit may be able to save money on an ACA-compliant plan outside of the exchange. Local brokers can help you compare options, but be sure to go to someone you trust. Ask for personal recommendations or use the Pennsylvania Insurance Department’s search tool, check their license status with the state and meet in person, if possible. You can also compare on- and off-exchange plans yourself through the Insurance Department’s website. If you know what plan you want, you can also sign up directly through an insurer. ACA compliant, coverage for preexisting conditions, and no lifetime limits are some keywords to help you make sure you’re getting a full coverage plan when shopping outside the government marketplace. Insurance is complicated and it can be hard to tell exactly what’s covered by a plan that isn’t required to meet ACA standards. For example, short-term health plans may cover hospital services, primary care, and doctor’s visits, but there may be caveats — a limit on payments for hospital services and doctor’s visits only when not related to a preexisting condition. 5. Beware of unsolicited insurance offers. The only time you can enroll in an ACA-compliant health plan is during the fall open enrollment period or if you qualify for a special enrollment period due to a “life event,” such as marriage, divorce, birth, or job loss. Insurers selling ACA marketplace plans generally won’t cold call you to try to get you to sign up. Pennsylvania’s Insurance Department relies on consumer complaints to identify and investigate bad actors. Complaints are up: The Insurance Department recorded 21 complaints about non-ACA plans in the first three months of this year, compared with 53 in all of 2018. The department has revoked licenses from a dozen bad actors since 2016, stemming from problems raised by consumers. You can file a complaint online at insurance.pa.gov or by calling 1-877-881-6388.